Well June is here and its time to run one of my favorite evens, Ninco Mclaren F1 Two Hour Enduro,Day /Night.The new Superflow Speedway is much faster than my Warwick farm Routed Track .This years race will be about driving smooth and staying on and with no squeeze section on this track it will make the racing close.We will run 15 Mins on each lane with the lights on and 15 mins with the lights out, with back ground lighting only. Sadly I can't make it Bo. Will be in Tumbabloodyrumba. Edited by gazza, 29 June 2008 - 03:57 PM. Looks like a good night but dinner at the Avalon at Katoomba was very good also. Up with Carols veggy bake actually Gazza. 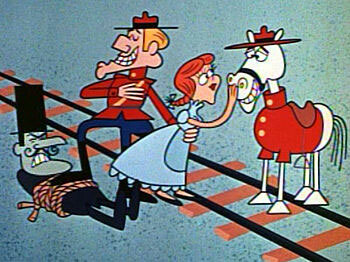 Who invited Dudley Do-Right? Nice photo of the Lark version, you can see the body roll. Thanks to all the guys that turn up for the forth running of the Mclaren F1 Enduro race, it was a good hard racing with over 8500 laps on the new track. Joe got a good lead in the first stage, but in the second stage I closed the gap to 1 1/2 laps but in the end Joe was to good and took the win by 3.40 laps. Dave and I had lots of close heats, he is a clean hard racer and I enjoy racing him.To Gary and Graig there first Mclaren Enduro, hope you enjoy it and will back back next year and Charlie, you chose the wrong car this year,better luck next year. Also thanks to Gary for taking some great photos and I hope evey body had a good time. Yep every body had a great time i don't know about yap yap but i'll be there again ....... be just in time to have to have a run on the next new track! No way, this track is here to stay.